Linda Bannon her son Timmy, now 9, were born with Holt-Oram syndrome. For most, the household chores are an arduous task. But for mother-of-one Linda Bannon, simple jobs such as cooking dinner in the evening, washing up and making the bed, present an almost impossible challenge. The 35-year-old was born with no arms - the result of the rare hereditary condition Holt-Oram syndrome, which affects bone growth and can cause heart problems. But Mrs Bannon refuses to let her disability get in the way of her living a normal life, using her feet in place of her hands. And the mother-of-one has passed on her inspirational attitude to her son, Timmy, who was born with the same condition. Like her, the nine-year-old has not let the condition hold him back. He can swim, regularly takes taekwondo classes and plays video games like any boy his age - using his toes to grip the controller. Mrs Bannon, who has taught herself to eat using cutlery, put on make-up and even sew using her feet, said: 'Timmy is just like any other little boy. 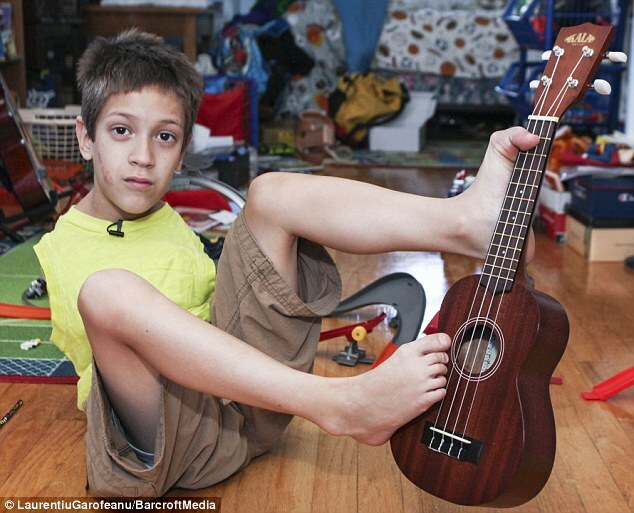 'He does his homework, plays Lego and tidies his room, all using his feet.